Our second December show in Cincinnati at the Phyllis J. Weston-Annie Bolling Gallery at M. Willis Fine Art & Design was successful for collectors, as well as for the educational programs presented in the gallery. The show included over fifty works by thirty artists. 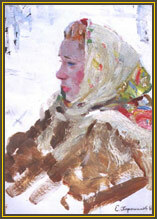 There were four academicians featured in the show: Pyotr Fomin, Anatoli Levitan, Vyacheslav Zagonek and Efrem Zverkov. Other artists included Alexei Sokolov, Nikolai Galakhov, Vasili Komolov, Evgeni Khoroshilov and Yuri Dyakov. Internationally, the Russian painting sales in London continued to set new records for individual works and for total sales. Sotheby’s and Christie’s sales totaled over $75M in their November/December auctions. Not quite the total for their Impressionist sales but showing strong increases. To date, the auction houses have concentrated on earlier/historic works. We concentrate on works from 1950 to today. As the auction houses have added later works, they have sold with excellent results. We see the later works becoming a larger share of the sales. As always, great works with a good provenance will bring the highest result. A number of art writers continue to see Russian and Chinese art as important frontiers for future collecting. Both countries are also rattling sabers about changing or closing their export markets for art and antiques. Time will tell. The Chinese influence on the Russian market remains significant. The Chinese are doing research and planning more shows in China. A number of artists from St. Petersburg, such as Nikita Fomin, are showing regularly in China. The artists’ ties come from the relationships developed over the years as Chinese artists studied at the Repin and Surikov and have gone on to become dealers and curators. A number of collectors from Cincinnati have visited the Guggenheim show and The Museum of Russian Art. Both of these venues have continued to spark interest in learning more about Russian art. Work is continuing on three new books. We originally hoped to introduce the Alexei Sokolov book in December but it appears that April/May will be the introduction date. The book will be printed in Russia with both English and Russian text. We are keeping Bown’s dictionary and Tradition Rediscovered in stock. Both may be ordered with a Visa or Mastercard. Our most recent acquisitions are works by husband and wife, Vasili Sokolov and Elena Tabakova. Both works pictured are in the 2002 Chinese book on the artists. Please let us know if we can help find a work, or if you just want to know more about Russian art.